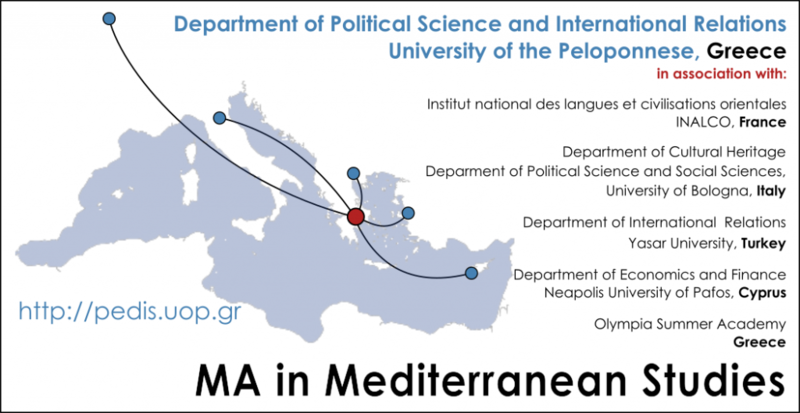 offers a Postgraduate Program Masters in Mediterranean Studies. The program of studies comprises seven core courses, two elective courses (out of which each student should select one course) and a dissertation. The program’s requirements corresponds to 75 ECTS credits. Twelve (12) Months, Full Time. Master of Arts (M.A.) in Mediterranean Studies. The degree is awarded from the University of Peloponnese upon successful completion of the program’s requirements. All partnering institutions are explicitly mentioned in the degree’s annex. Students attend courses in the coastal city of Corinth, in Greece. The Department is conveniently located an hour away from Athens, easily accessible by train and bus.